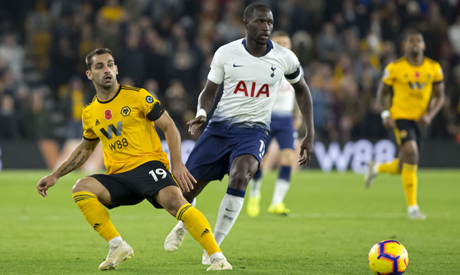 Wolverhampton Wanderers' Spanish defender Jonny Otto (L) passes the ball under pressure from Tottenham Hotspur's French midfielder Moussa Sissoko during the English Premier League football match between Wolverhampton Wanderers and Tottenham Hotspur at the Molineux stadium in Wolverhampton, central England on November 3, 2018. AFP. Wolverhampton Wanderers' Spanish defender Jonny Otto could be set for a long spell on the sidelines after injuring knee ligaments in Spain's international friendly with Bosnia on Sunday. Otto, who has started all 12 of Wolves' games in the Premier League this season, was forced off early in the second half of Spain's 1-0 win in Las Palmas and, according to reports in the Spanish media, he left the stadium on crutches. "The player underwent an initial exploration in the dressing room and felt pain compatible with an injury to the collateral medial ligament, which, although pending confirmation, could be a grade two or three injury," said a medical report published on the Spanish football federation's website. "He will undergo an x-ray to confirm the diagnosis and rule out other injuries, and his club will be informed of all developments."